I personnaly like semi-precious and gemstones. Their uniqueness makes my creations one-of-a-kind. It can be whimsical, colourful, elegant, beautiful, intricate and so much more. Ok....can I add glass to my list too? I want to like pottery beads! Maybe Silver Clay beads would be to your liking! The best of both worlds!! Oh that would be nice. I wanted to try the silver clay but don't need any jewelry....But beads would be so nice and I could use them around my neck or in stitch markers for knitting. Gee I could even give them away!!! Actually this leads to a question I have. Is it possible to create something with clay - ..maybe a bead (?? ), and then work some silver clay details into the surface? Are they compatible or would it just be a no-no? Oh yes that is totally possible! In fact I will be having a class on making **big** silver clay beads. We will use clay as part of it! Let me know a good date for you if you are interested in the class. I think it will be an evening class. Maybe a Thursday or Friday Night. Check out the class calendar on the web-site to see open dates. And then I post a class time. Now THAT sounds exciting!! I'll keep my eye on the calendar, it would be nice if it were when the evenings were a bit brighter and the weather not so snowy, but it doesn't really matter. Hi Jeannette and Louise and Jane. I have a recent beading magazine that shows and tells how to "paint" lava beads with silver clay paste. they look amazing. I'll bring the mag into the store if you ladies want to take a look. it might be an idea for one of the monthly clay projects. Jackie told me about that article....it was by someone she knows. I will order some lava beads for us! I thought they looked amazing! I can't wait for our class. The possiblilies are endless! JHere is a peak at some of Jackie's new work....she has made some art pieces using silver clay and glass!! I think you will LOVE this piece. She won a prize for it in Japan! Oh my gosh that is incredible detail! I have to confess I don't know what a lava bead is, but that piece there certainly deserved to win something! 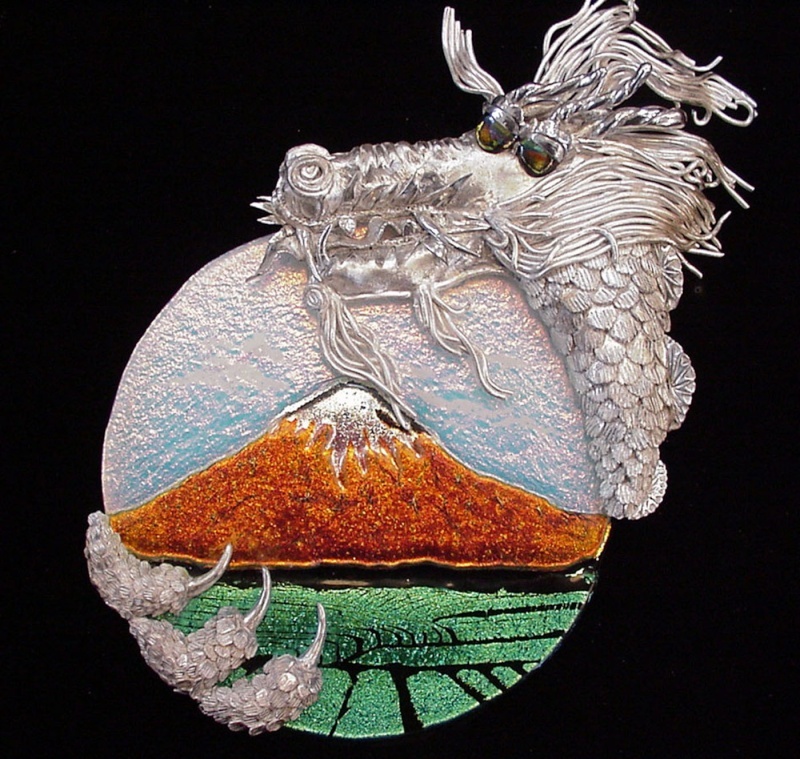 The dragon piece is with Art Clay and glass. The lava beads are just that lava...so they look like black feta cheese. We can paint them with silver clay and make really interesting beads.